Travel theme: Paint | Oh, the Places We See . . . 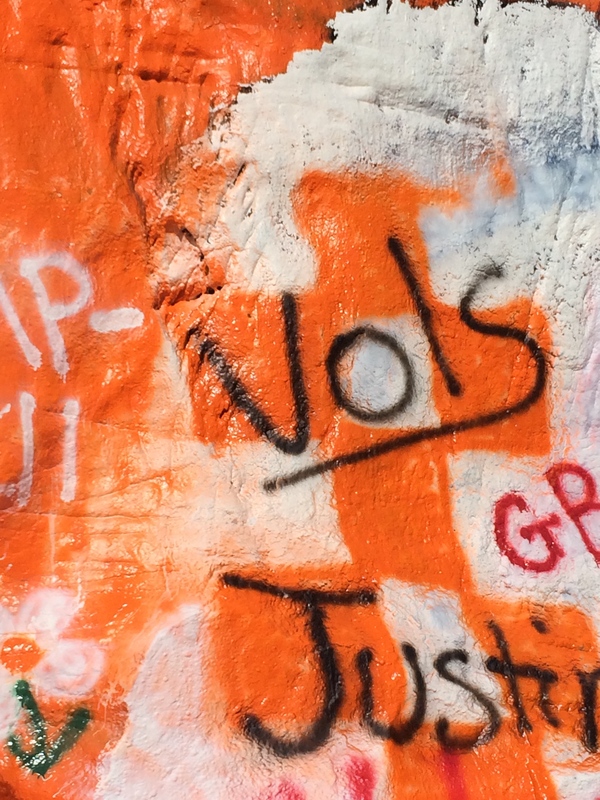 So, you might ask, How many times has The Rock on the University of Tennessee campus been painted? And the answer would have to be, No tellin’! The Rock is simply an enormous boulder that’s been moved at least once since we were students at UT but has been been a rock-solid canvas for literally hundreds of students over the years. Spray paint, wall paint, touch-up paint — The Rock has seen it all. The predominant color comes as no surprise to anyone. This is Big Orange country, after all. And over the years, we’ve seen celebratory messages, political insight, even personal notes like you’d see on social media today. The Rock may have been the university’s first Twitter account! Big Orange is the dominant color on The Rock. Well, usually. One thing’s for certain, though. If the administration ever has designs on removing it, they’d better be ready for a fight. 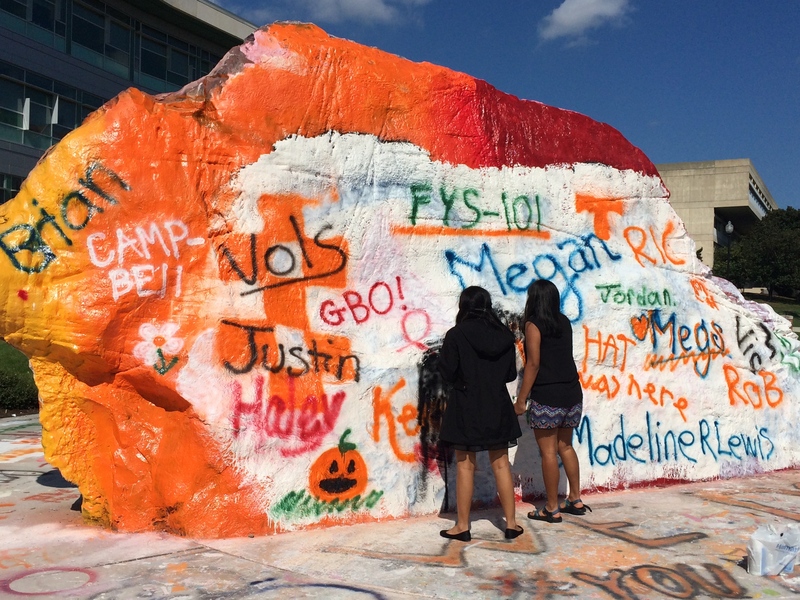 Painting The Rock is one solid student tradition! Artwork or a mess? The Rock is always up for interpretation. For more entries in Ailsa’s Travel Theme: Paint challenge on her blog Where’s My Backpack, click here. 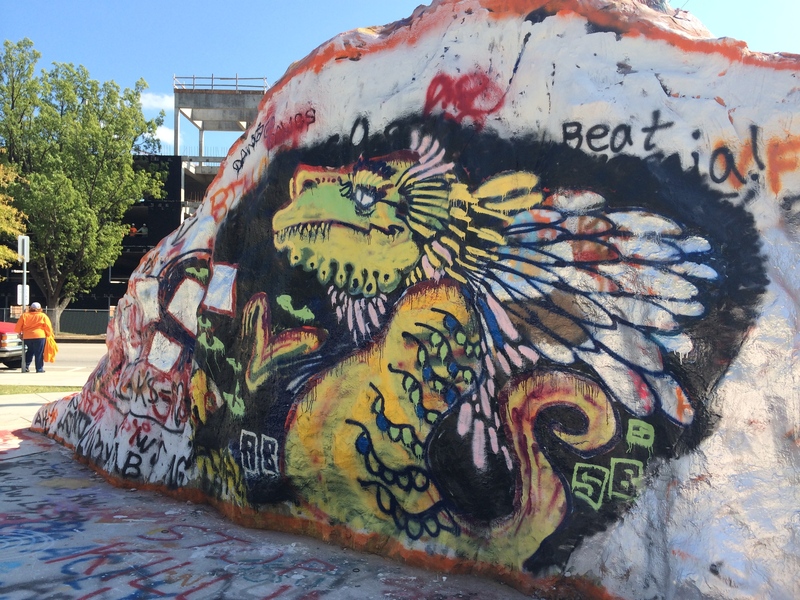 This entry was posted in Tennessee, Travel Theme and tagged The Rock, Travel theme: Paint, University of Tennessee. Bookmark the permalink. We’re older than Peggy!! We both were there from 1963-1967, but then went on to pursue other degrees. Bert worked at UT for 31 years, give or take a couple of years for the Vietnam War! We all may know some people in common. What a great way for students to express themselves. Much better than spray painting buildings! You’re right. I took these pics yesterday. Was hoping for something celebrating the win over Georgia this past Saturday. But it looked like mish-mash mostly. It comes and goes, but you’re right — great venue for venting! Wow! That is so cool. I have only been to New Orleans. I have neglected the south even though my husband was a prof at Chapel Hill. I need to work it in the the agenda…… Your posts rock! Thanks, Cindy. There’s lots to see in the South. And Tennessee is a great place to start. Come on down!